The nematophagous fungus Pochonia chlamydosporia (Clavicipitaceae) is a facultative parasite of major plant-parasitic nematodes pests such as cyst (Globodera spp., Heterodera spp. ), root-knot (Meloidogyne spp. ), false root-knot (Nacobbus spp.) and reniform (Rotylenchulus reniformis) nematodes. The potential of P. chlamydosporia as a biological control agent and biopesticide has been the subject of numerous studies aimed at understanding the micro-ecological conditions that allow the fungus to thrive in the soil and rhizosphere environments. Pochonia survives in soil in the absence of plant and nematode hosts and can also behave as an endophyte. Research evidence points to a physiological ‘switch’ from the saprophytic to the parasitic stage that is triggered by nutrition. The basic biology of the fungus and sedentary endoparasitic plant nematodes is reviewed to provide insights into the fungus multitrophic behaviour, as well as its importance as a biocontrol agent within an integrated pest management approach. The authors acknowledge Penny R. Hirsch (Rothamsted Research) and Elaine Ward, (formerly at Rothamsted Research), DFID grant BB/F003994/1 and Defra Link Project LK0966. Light microscopy and SEM studies were performed at Bioimaging Rothamsted Research facilities. Jones, J. T., Haegeman, A., Danchin, E. G. T., et al. (2013). Top 10 plant-parasitic nematodes. Molecular Plant Pathology. doi: 10.1111/mpp.12057. Sellitto, V. M., Curto, G., DallaValle, E., et al. (2016). 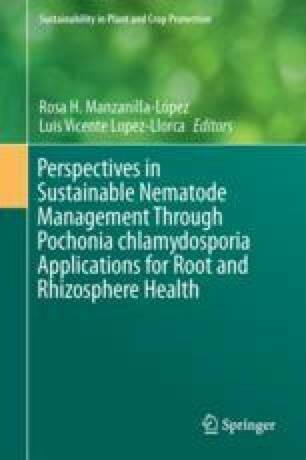 Effect of Pochonia chlamydosporia-based formulations and the regulation of root-knot nematodes and plant growth response. Frontiers in Life Science, 9(3), 177–181. doi: 10.1080/21553769.2016.11193827.